Currently, Flanders lags behind many other European regions with regard to disclosing its oral history collections. Despite recent attempts undertaken by cultural heritage institutions to make Flemish audio collections more accessible over the Internet, the widespread distribution of these historical sound materials has yet to be realized. Based on discussions with stakeholders, the authors of this article map the current situation in Flanders regarding the preservation and dissemination of spoken word collections. Furthermore, we critically assess the technological and, in particular, the organisational feasibility of an innovative disclosure application by means of a SWOT (Strengths, Weaknesses, Opportunities and Threats) analysis. With our findings, we hope to inspire cultural heritage and archive institutions to digitise and open up their audio-visual collections. We hope as well to provide food for thought about possible opportunities and pitfalls for similar archiving projects. Currently, Flanders lags behind other European regions when it comes to using innovative tools to facilitate access to its oral history collections. Oral history collections (also referred to as spoken word collections) bring together unique testimonies and shared memories about a region's history. In this article, we refer to audio recordings of the spoken word, personal interviews and historical testimonies (De Wever & Fran�ois, 2003) in the specific region known as Flanders. Despite recent attempts undertaken by several heritage institutions to make these historical sound materials more accessible over the Internet, the widespread dissemination of so-called oral sources has yet to be realized (Evens, Hauttekeete & Mannens, 2008; Vande Winkel, 2004; Vande Winkel, 2005). Instead of risking the synchronous and expensive development of similar applications by several institutions working independently, it seems to us that it would be more efficient to exploit a common development trajectory. This allows the heritage sector to enjoy scale effects from cross-sector partnerships. However, research should reveal the feasibility of such a shared, innovative system and its possible implications for more efficient preservation, inventory, disclosure and valorisation of oral history in Flanders (Walterus, 2006). This article mainly focuses on the digitisation, metadata and disclosure issues related to repositories of spoken word collections. We provide a brief overview of the situation today regarding the preservation and dissemination of oral resources in Flanders and map the opinions of its institutional users. To obtain the opinions, we set up a quantitative survey amongst 19 heritage institutions and archive libraries, and we conducted face-to-face interviews with representatives from 12 national and international heritage institutions (including the British Library Sound Archive, the Dutch Institute for Sound & Vision, and others). This enabled us to gauge the current and future visions concerning the disclosure of spoken word collections in Flanders. Moreover, it allowed us to evaluate the technological and, in particular, the organisational feasibility of an innovative application by means of a SWOT analysis. Although there is a wide range of producers of spoken word recordings, relatively few of the recordings have been deposited within archive institutions. This is partly due to the fact that Flanders lacks any institution explicitly assigned to support the preservation and disclosure of these oral resources. In addition, we found a large discrepancy between archives on the one hand and heritage institutions on the other hand regarding the actual number of recordings, the growth and disclosure of such collections, the presence of contextual information and the degree to which these resources have been digitised. Moreover, all the Flemish institutions involved in our project indicated that these spoken word items represent only a marginal part of their total collections and therefore are of a low priority within their everyday work practices. Whereas archive institutions (assigned to preserve all kinds of heritage materials) store a few hundred interviews and testimonies in oral form, each institution in the heritage sector (primarily focused on stimulating cultural heritage participation among citizens) may hold only a handful of spoken word items. However, on the production level the collection of the latter has been growing quickly, thanks to heritage institutions' participation in recent heritage projects, whereas the archives' collections are rarely updated with new material. In our research we found that the growth of oral history collections largely remains dependent on new projects and therefore on the provision of public subsidies. In the practice of archiving spoken word recordings, the availability of contextual information is very important. Clustering together the identification card, contents card, transcription, contract and the recording itself is crucial to situate, identify and evaluate the item. We should also mention that as time goes on interviews are transcribed less frequently because such transcription is labour-intensive. Consequently, automatic speech recognition has come to offer a promising alternative to the time-consuming practice of transcription. Automatic speech recognition technology has already been applied in the Dutch heritage archiving project Choral, for example. Few legal contracts between interviewer and interviewee of recorded items exist; therefore, it is unclear if these oral history items can be distributed online for future, unrestricted use, because the intellectual property rights to these items are unknown. Even when such contracts do exist, since a large number of recordings date from the pre-Internet era, most of those contracts fail to address issues of online (re)use and distribution. As a result, further enhancement of these recordings is hampered despite their scientific, socio-cultural, historical, educational and even economic value. To date, most of the items in the sound archives have not yet been digitised although digitisation is required for developing an online disclosure mechanism. This shortage of digitised audio material is especially true for the archives' tape-based collections, which were often acquired through donations made decades ago. Due to the enormous effort required (in time, money, people...) to digitise these analogue materials, this essential process is seldom of high priority within the archives' everyday work practices. On the other hand, because heritage institutions have been involved only recently in oral history projects, in most cases they own born-digital recordings. In addition, because these heritage organisations usually have smaller collections, they can digitise their analogue materials much more quickly than archives can. Even so, we discovered that overall the sector urgently needs more knowledge and resources to digitise existing analogue items rather than starting up new oral history projects. The significant differences between archive and heritage institutions concerning their levels of digitisation are also reflected in the extent of disclosure and accessibility to a wider audience. In this context we refer to disclosure as the structured classification of materials that allows quick and efficient search of the collections by employees, users or other stakeholders. Together with digitisation, a thorough, standardised description system is indispensable for making cultural heritage items accessible via the Internet. In this regard, we found that the institutions we investigated all have a systematic and structured archiving policy, which is intended to maximise the disclosure of collections, although we note that spoken word collections are better searchable within archives when compared with heritage institutions. As previously mentioned, an adequate disclosure mechanism demands a standardised metadata model, or at least the consistent use of key words and labels. After all, the description of materials (both regarding content and form) should result in an optimal 'browse and search' of the collection and should facilitate the exchange of heritage materials. The standardised metadata models now being used predominantly within the investigated institutions are ISAD(G) and ISAAR. However, a few organisations have chosen to use a model they developed themselves. 3. Towards an innovative disclosure application for Flanders? 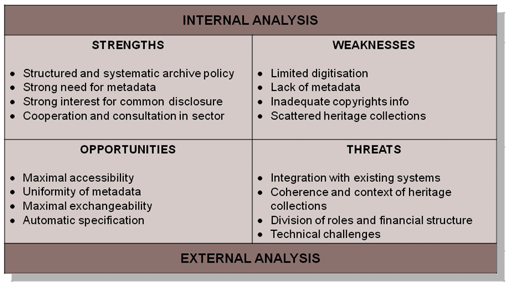 Despite the implementation of several different metadata schemes within the cultural heritage field, we discerned a clear call for one standardised metadata model for describing heritage materials, both when it comes to content and form. This structured approach should permit more efficient cooperation between various institutions. Nowadays, such cooperation is not that evident due to the different description mechanisms and search procedures that have been implemented. A shared metadata model would certainly be a step forward and would permit users to browse heritage materials scattered over all institutions via only one search engine (Imhof, 2008). Moreover, the implementation of a standardised metadata model would reflect the current tendency to describe materials as briefly as possible in order to save time and effort. Concise and more general metadata, bundled in a standardised metadata model, should thus be considered. Storing digitized audio materials in a joint repository is another innovative way to disclose the materials, but we found that the heritage sector is not very enthusiastic about this approach. Heritage institutions argue that a joint repository endangers some basic principles of archiving, especially when it comes to origin and structure. To be more specific, they fear the context wherein the item has been produced would be lost. Another more implicit reason might be the loss of institutional control whereby institutions retain their influence and decision-making power over their own collection. We evaluated the feasibility of an innovative disclosure application by means of a SWOT analysis, which is a strategic planning method often applied to assess the strengths, weaknesses, opportunities and threats involved in a project. The internal factors are described in terms of strengths and weaknesses, while the external analysis deals with opportunities and threats. Figure 1 summarises the main findings of our analysis, which were obtained by means of a questionnaire, interviews and literature reviews. The most important strength resulting from a structured and systematic archive policy would be disclosure of heritage materials as efficiently as possible. Optimal and efficient disclosure of materials, for internal as well as external purposes, should be omnipresent within organizations. A standardized metadata model for use among institutions is urgently needed for the annotation of heritage materials. Furthermore, given the tendency to describe collections as briefly as possible, the current ISAD(G) standard no longer seems the most appropriate standard to use for this purpose, so a modular metadata standard should be considered instead. Along with a greater demand for standardised metadata, we also noticed a strong institutional interest for a common disclosure application. The suggestion of making the scattered materials collectively available, linking the various databases and disclosing them via one search engine has been loudly applauded by the cultural heritage sector. Finally, the established  although modest  cooperation between institutions already evidenced in certain projects form a fruitful basis for further negotiations about the implementation of a uniform metadata model and the development of a common disclosure application. Our analysis revealed the most obvious weakness is the shortage of currently digitised heritage material. Moreover, given that converting older analogue items would require a heavy investment of time, personnel and financial resources, digitising these items has not been a high priority for the larger archives. The shortage of a sufficient amount of digitised material is, in this perspective, a clear barrier for the successful development of a common digital disclosure application. Furthermore, the current lack of metadata for audio items in collections can be considered a weakness in the policy of safeguarding oral sources. Too specific, inconsistent and/or absent metadata hinder efficient description, optimal disclosure, and productive cooperation amongst institutions, as well as hampers the fluent integration of different operating systems. The unclear intellectual property status of most of the audio materials is another bottleneck. Given that institutions often deal with older materials, a lot of problems arise concerning copyright and intellectual property rights. Whether or not it is legal to disseminate and valorise these materials via the Internet is not that obvious. Lastly, audio collections have been scattered over numerous institutions that have been developing their own practices for describing and disclosing the materials they hold. This hinders creation of a joint disclosure policy. In addition, such decentralization frequently leads to the inefficient use of resources. The creation of an innovative disclosure application clearly enlarges the availability, accessibility and repurposing of different kinds of historical items. By means of a common disclosure on the Internet, Flanders' unique heritage collection may become visible for a variety of target groups and suitable for different purposes: scientific, educational, cultural, media, etc. In this perspective, an easily accessible, user-friendly, structured and up-to-date system is essential for the further valorisation and democratisation of 'rich' multimedia content from the past. Secondly, an innovative disclosure application could overcome current fragmentation when it comes to metadata models. A shared model of concise metadata would make it possible to meet each institution's expectations and needs, inspired by international best practices. Such a shared, minimal metadata set also offers more opportunities for closer cooperation between institutions, concretised in the easy exchange of materials. Again, this fosters greater visibility and use of these valuable collections within the educational, socio-cultural and political fields. Finally, the development of a shared disclosure application would provide a fruitful basis for exploring new (fully) automatic attribution methods for metadata creation, which would then optimise the digital workflow within institutions. One possible major threat is the incompatibility of the current disclosure applications used by various institutions. A joint disclosure system implies an integration of the present applications into one global model. The absence of a uniform metadata model and the diversity of file formats are factors hampering an easy technical integration process. In addition, attention should be paid to the connection between materials and the context in which they have been recorded, conserved and disclosed. After all, reducing heritage items to mere consultable files could harm their historical value, which is determined by their context and their connection with other collection items. Above all, the role of the different actors involved should be precisely defined, and any vagueness about the cost structure of digital archiving and disclosure should be avoided. Financial agreements should be made in advance, taking into account the position of the particular institutions within the cultural heritage sector as a whole. Another technical challenge is the continuous support and updating of such an application. Systems should update themselves in relation to the changing environment in order to prevent rigidity. Therefore, future orientation and flexibility are important issues to be considered when developing the innovative disclosure application. The current situation in Flanders regarding the preservation and disclosure of oral history collections is in many ways an ideal starting point for the development of a shared disclosure model. Nevertheless, our research has also revealed some major barriers that could obstruct the future of this project. The weaknesses, such as poorly documented rights management and the shortage of digitised materials, should thus carefully be scrutinised when developing this kind of application. Furthermore, the establishment of an application designed exclusively to disclose spoken word collections should be questioned. After all, the institutions we researched pointed out that taped memories and testimonies only make up a small part of their heritage collections and are of low priority within the institutions' daily workflow. As a consequence, we propose a much broader approach for implementing common disclosure, taking into account the wide spectrum of heritage materials such as text documents, pictures, videos, artefacts, etc. This way, collective memory becomes accessible via one searchable database. We believe that a 'one-stop-shop search engine' bringing together the total heritage collection  which is currently scattered over numerous institutions  should be the ultimate goal. The current trend toward linking separate databases in a meaningful way should therefore not be ignored. The coupling of the iconographic, audio-visual and textual memory would optimise people's access to the scattered heritage collections by means of only one mouse click. As a result, interested users could then search and consult text and audio-visual fragments as easily as they can now search other resources using Google. The development of a shared metadata scheme applicable for all types of heritage materials is an immense challenge. After all, the accurate description of moving images, pictures and text is a titanic job. Nevertheless, we remain convinced that one global application should become the dominant disclosure model for the future. The added value a completely new application would leverage in comparison with current systems should be investigated. To date, some archives have already united via certain databases and disclosure applications (e.g., ODIS or LIBIS-Net). Therefore, we feel that an extension on the existing and implemented systems should be considered. A similar assertion can be made concerning metadata models. Although the current ISAD(G) standard does not fulfil everyone's needs and expectations, it is a good starting point for a more demand-driven model. In this perspective, in order to ensure compatibility the development or implementation of an all-embracing metadata scheme should involve the adaptation of existing models. In addition, further research should lead to the automatic creation of formal metadata (for instance by use of speech recognition). Finally, we should not neglect the user in the creation of an innovative disclosure application. Due to the time-consuming nature of cataloguing and describing resources, increasingly we see an evolution toward involving outsiders (volunteers, seniors, and others) in the process of describing cultural heritage items. The rise of Web 2.0 has accelerated this trend, in which we notice a shift from passive users towards more interactive participants. Thus, the user can deliver his or her own content, has some control over the format and also decides how something should be described (social tagging). Above all, new forms of accessibility and a greater amount of available digitised cultural heritage content can result in greater benefits to the public (Berte, Hauttekeete & Nulens, 2008). A virtual introduction to such content leads not only to a stronger interest on the part of users, but also to improved accessibility for persons who are, for one reason or another, physically unable to consult the diverse array of art and heritage collections held in scattered institutions. To conclude, the digital disclosure of archive and cultural heritage collections should offer a unique opportunity to stimulate interest in and use of cultural heritage resources. Moreover, the richness of the Flemish cultural heritage sector is being revealed, leading to better conservation, more intensive use and further academic valorisation of these collections. This article reports on the main findings of a research project commissioned by the Flemish Ministry of Culture and mainly focuses on issues of digitisation, metadata and disclosure related to oral history. It was incorporated in the PokuMOn project, which aimed to explore and develop innovative and efficient disclosure tools for cultural heritage in Flanders. The research was supported by grants from the Interdisciplinary Institute for Broadband Technology (IBBT). MICT and MMLab (both Ghent University) worked together as research partners. Berte, K.; Hauttekeete, L. & Nulens, G. (2008). Broadband for culture, culture for broadband. Proceedings of ECREA's 2nd European Communication Conference. Communication Policies and Culture in Europe, Barcelona, 26-28 November, 2008. <http://www.ecrea2008barcelona.org/guide/download/370.pdf>. De Wever, B. & Fran�ois, P. (2003). Gestemd verleden. Mondelinge geschiedenis als praktijk. Vlaams Centrum voor Volkscultuur: Brussel. Evens, T.; Hauttekeete, L. & Mannens E. (2008). Surfen naar het verleden: de ontsluiting van mondelinge historische bronnen in Vlaanderen. Faro/tijdschrift over cultureel erfgoed, volume 1(1): 26-32. <http://www.faronet.be/files/pdf/pagina/2008_1_surfen.pdf>. Imhof, A. (2008). Using international standards to develop a union catalogue for archives in Germany. Aspects to consider regarding interoperability between libraries and archives. D-Lib Magazine, volume 14(9-10), <doi:10.1045/september2008-imhof>. Vande Winkel, R. (2004). Bewegend geheugen, een gids naar audiovisuele bronnen voor Vlaanderen. Academia Press: Gent. Vande Winkel, R. (2005). Mondelinge historische bronnen in Vlaanderen. Een stand van zaken en enkele beleidsaanbevelingen. Mores, volume 6(1): 9-14. <http://www.faronet.be/files/pdf/pagina/2005_1_mondelingegeschiedenis.pdf>. Walterus, J. (2006). Vlaams onderzoek naar ontsluiting van mondelinge bronnen. E-data & research, volume 1(2): 7. <http://www.edata.nl/0102_010906/pdf/0102_010906_7.pdf>.